Zions Hill has been host to Prophetic Worship events for the last 10 years. 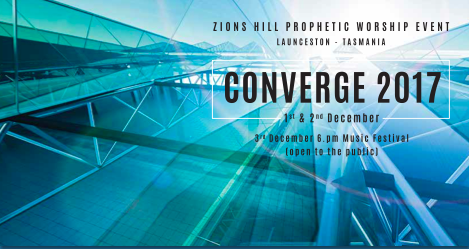 These events commenced after Zions Hill Church (formerly The Vine) moved into an amazing multi million dollar facility in Ravenswood, Launceston (a miracle provision from God). Senior Pastor Merrilyn Billing felt called of God to gather worshipping warriors to join together in Powerful Prophetic Worship. Strong Declarations and decrees are made in the atmosphere of worship under the unction of the Holy Spirit. It is in these times that strongholds are broken over situations and regions as the Lord leads. Unshakeable Praise ploughs through rock hard ground and prepares the way. Miracles happen on the wings of Apostolic Prophetic Worship. To God be the Glory!! It was 2008 and worshipers had gathered from across the nation of Australia for the Zions Hill annual Prophetic Worship Event in Launceston Tasmania. Being a Prophetic Worship event, we are always listening for the direction of the Holy Spirit. On the final night of the event, when we were in High Praises to God, many said they could hear the sounds of the didgeridoo. Pastor Merrilyn realized that the Lord was showing us what He wanted for the next event. He began to speak to her about the importance of the ancient sounds of the nation being included in our worship. God began to show her that the voices and sounds of the indigenous people must be heard. Heaven was waiting for the combined sounds to be come forth. A door began to open that has since amazed and moved us more than we can say. The 2009 Worship event was a wonderful door opener to what God was beginning to set up for future events. The following years 2010 and 2011 were building on the previous event. So much was happening than only Heaven could have orchestrated. There were many powerful moments as both Indigenous and non Indigenous Australians joined together in powerful dynamic worship. New songs came forth. We danced together, hugged, washed feet, and all marveled at the unfolding miracle. It was clear that God was uniting our hearts together and doing something that no man could have organized. We were privileged to have the Indigenous Bible College students come in from Tweed Heads with Pastor William Dumas, Darryl and Edwina Lingwoodock, singers Pat Morgan and Robyn Green and Didjeridoo player and dancer Ettikai Reuben, and our friends from the 2009 event, Rose Rigney and Lynnette Wanganeen. 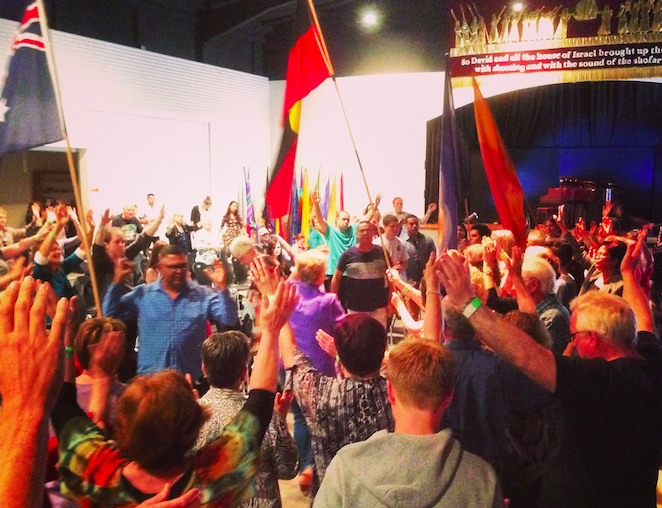 In 2011 the Lord moved on us to make some powerful decrees for Indigenous Australians. It was clear the kingdom of Heaven was presiding over this move for a new day. Shortly afterwards the Australian Prime Minister came on television announcing a change in Australia’s Constitution to recognise the indigenous people as the First Australians. Praise the Lord! In 2012, WELCOME HOME to the Father’s House was the emergence of a New Day where our first nation brothers & sisters stand in their authority as the elder brother to release healing to the nation. In 2013-2014, we continued to gather together with our Indigenous brothers and sisters! Throughout these Events, God has been bringing forth new sounds, new songs and deeper revelations of His Spirit! We were so blessed with the ministry of Dr. Royree Jensen and Ps. Isi De Gersigny! CONVERGE - Gathering In The Glory 2015 "This was a very powerful worship event with global and national speakers and musicians from diverse backgrounds joining together with people from all walks of life in God's glorious presence." God moved mightily as we brought together ministries from America, Malaysia (originally Uzbekistan), Philippines (originally Ireland) and Australia. Dr Brian Simmons, Brian Longridge and Mayya Musaeva ministered very powerfully as well as Ps. Willie Dumas, Pat Morgan and Ettikai (Rebus) Reuben. Check out 'Out Of The Shallows' CD plus our other beautiful albums recorded Live at this Event in our Online Store! Converge 2016 was a joining together of people from many different churches and backgrounds as well as a powerful convergence between Heaven and Earth!!! There was great anticipation of what God had planned for this Event! We had Ps. Tom Inglis (Sydney life Church/Psalmody International) with us for the Friday of Converge and he was joined by Mayya Musaeva, Ps. Willie Dumas, Lynnette Wanganeen and Pat Morgan. Converge 2017 - Join us this year as we come together with Dr. Brian Simmons - Stairway Minisitries/The Passion Translation), Brian Longridge - Concert Pianist from the Philippines (originally Ireland) and Mayya Musaeva - Concert Master Violinist from Malaysia (originally from Uzbekistan) as well as some of our beloved First Nation Family, Ps. Willie Dumas and Pat Morgan. This year we will also have a group from the Torres Strait Islands joining us to minister with song and dance. We would love to fill Zions Hill this year so make sure you Book Now!